Question from GoPro Forum: "I recorded a lot of footages with GoPro during my ski holidays. There're also a lot of useless footages that I want to cut out but keep original resolution and frame rate. I used GoPro Studio to cut the footage but when I convert to either .avi or .mov (the two options provided) while keeping the res and fps, the resulting files are 8 times larger! How can I just take the recorded MP4 movies, cut them and save in the same format with the same settings while reducing the file size proportionally to the reduced movie length?" GoPro can help you produce excellent footages for sports and travel. Meanwhile, something unwanted segments probably appear resulting in small flaws in whole clip. You're believed to film an absolutely perfect work free from all defects but you also know that it's too big to share online. In any case, it's necessary to cut GoPro video to remove useless parts or reduce length for size shrinking. Quality is important as well. The resulting file with high or furthermore original resolution and frame rate is preferred. If you haven't yet found an available solution to cut GoPro video without compromising quality, we would like to give a help. 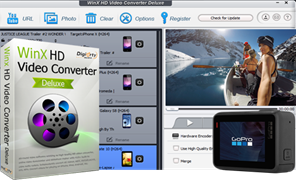 WinX HD Video Converter Deluxe shows its high performance and ease of use for beginners who're trying to cut GoPro videos. Besides format conversion, it is developed with editing features allowing you to trim undesired part off GoPro footages. The preview window and process bar work as references helping you confirm specific start/end time for splitting. According to the needs for quality, you can manually set video parameters (resolution, frame rate etc.) as original or adjust to appropriate values. For online sharing, it embeds YouTube, Facebook or other web profiles with preset parameters to make your video perfectly fit best upload settings. It supports all GoPro HEVC/H.264 MP4 videos in 4K/2.7K/1080P @ 30/60/120fps. This GoPro video cutter wraps level-3 hardware acceleration tech to automatically invoke graphic cards (Intel/NVIDIA/AMD) to speed up video encoding, decoding and processing while delivering nearly lossless quality. Step 1. Launch WinX HD Video Converter Deluxe after it is successfully downloaded and installed on computer. Click Video button and Video Converter window appears. Click +Video button to import your GoPro video. Batch input is allowed. Step 2. Before cutting a video, what you should do is to select an output format. Move the mouse to the bottom of the window. Click Popular tab to check whether there is a wanted format. If not, click Target Format to get more profiles and select what you want. Certainly, you can select the format of source footage as output. It is suggested to convert GoPro HEVC to H.264 if your device or computer is not compatible or competent with HEVC. Also, you can click Codec Option to adjust frame rate, resolution, aspect ratio etc, or make parameters "keep original". Step 3. Click Cut to access to video editing window. There are two panels. On the top, a mini player gives original and preview video comparison for your reference. And, the progress bar with two green cursors is presented under the player. Move cursors to set start/end time. Click Cut button next to progress bar to cut wanted part. The cut part will be listed on the bottom panel with a name of Clip 1. You can repeat moving cursors and cutting to get clip 2.3.4... as you like. All clips will be merged into one file. Next, click Done if you have gotten needed clips. Step 4. Click Browse button to define a new destination folder if necessary. 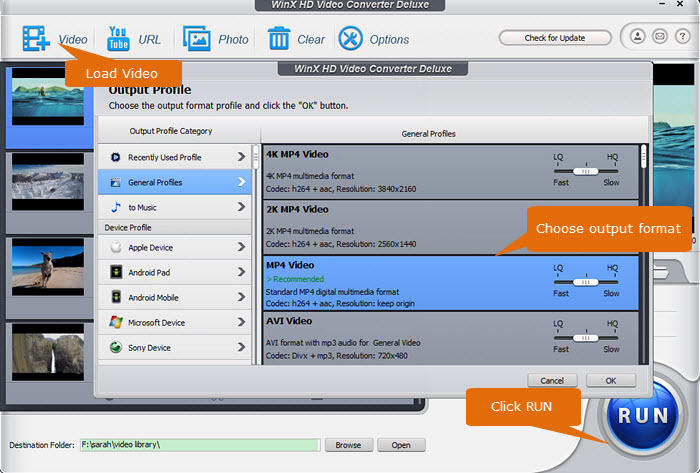 Click RUN button to make WinX HD Video Converter Deluxe cut your GoPro video(s). Hardware acceleration (Intel/NVIDIA/AMD depending on your graphic cards) will be automatically enabled to speed up video processing. After WinX GoPro video cutter finishes its task, destination folder containing the cut video will be opened automatically. Check whether it keeps high quality and upload online immediately or later. What's More Can VideoPoc Help You to Customize GoPro Videos? • Crop/merge/rotate/flip videos; stabilize shaky image; denoise audio; correct fisheye; add effects/subtitles/watermark; convert video to gif; extract frames from video and other advanced editing options. • Convert GoPro HEVC/H.264 videos to AVI, WMV, MOV, FLV, 3GP, iPhone, iPad, Android, Windows Mobile, Sony PlayStation, Xbox, Chromecast etc, with high quality. • Downscale GoPro 4K/2.7K video to 1080P, 1080P to 720P and compress GoPro videos by lowering bit rate, frame rate to smaller size but better quality. • Download 4K/2.7K/1080P GoPro videos from YouTube, Facebook, Vimeo, Twitter, Instagram with ease. 4K - K resolution, also called 4K, refers to a horizontal screen display resolution in the order of 4,000 pixels. There are several different 4K resolutions in the fields of digital television and digital cinematography. In television and consumer media, 3840×2160 (4K UHD) is the dominant 4K standard. In the movie projection industry, 4096×2160 (DCI 4K) is the dominant 4K standard..